Product Description: Redmi Note 6 Pro comes with the latest preferred Qualcomm Snapdragon 636 processor, with 4GB or 6 GB RAM. The processor packs eight Kryo 260 cores clocked at 1.8GHz. It is a fantastic mid-range SoC. Battery life is excellent of over a day and a half with 4,000mAh. The Xiaomi is clearly playing the big daddy game in the budget phones arena, and the series is just cruising to be the most popular among the Android phones, and no doubt the Redmi Note series has catapulted the Xiaomi to a meteoric rise in the last couple of years keeping the sales momentum going on. The Redmi Note series has got “no chill” when it comes to the product releases. The Redmi Note 5 series was launched in India in the month of February 2018, and soon later after eight months, the Redmi fans were delighted with the launch of successor Redmi note 6 Pro. Like any other Xiaomi product, the Redmi Note 6 Pro cashed in the popularity as one of the best mid-range smartphones at the best deal. GearBest brings you another big deal for the Redmi Note 6 Pro, but before you get the product added to your cart, let’s know why this makes a great choice! The Redmi Note 6 Pro comes with comes with a MicroUSB port and a sleek SIM tray to comprise your two Nano-SIM cards and one microSD card. Redmi Note 6 Pro comes with the latest preferred Qualcomm Snapdragon 636 processor, with 4GB or 6 GB RAM. The processor packs eight Kryo 260 cores clocked at 1.8GHz. It is a fantastic mid-range SoC. Battery life is excellent of over a day and a half with 4,000mAh. The performance game of Redmi Note 6 Pro is all slaying in the market. The Redmi Note 6 Pro has the awe-inspiring design and functionality. The device features a subtle and elegance arc designs on the back, and the rounded corners let the phone go easy-embracing your palm. There is also a water-resistant P2i coating, and the metal body looks stunningly solid. Keeping up with the trendy notch, the Redmi Note 6 Pro sports a larger 6.26-inch display with a notch on the top. 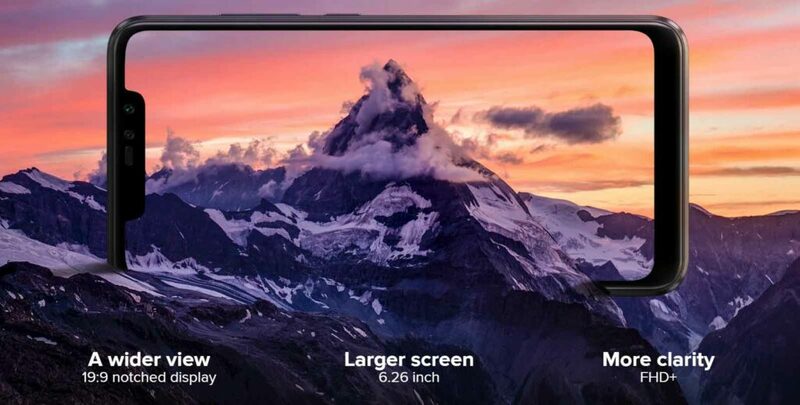 The notch allows the Xiaomi to increase the display size. The panel on this successor of Redmi Note 5 Pro looks gorgeous with vibrant color, images and text appear quite crisp. Among the smartphones lying in the mid-range, the Redmi Note 6 Pro makes the greatest deal with the best display out there. The camera is where the Xiaomi leads the mid-range smartphone. 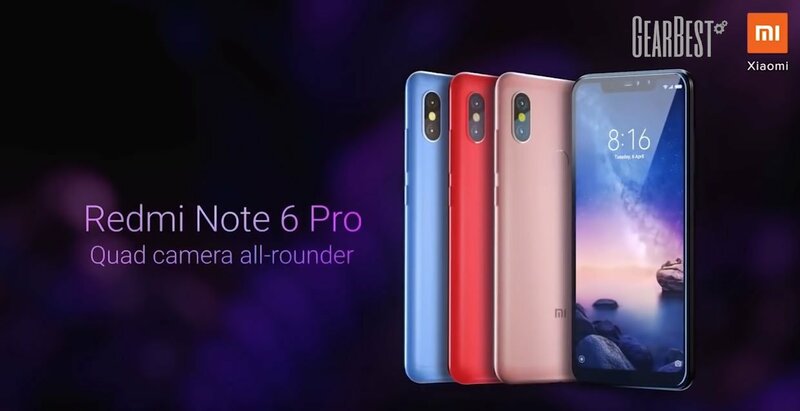 With the Redmi Note 5 gaining the popularity as the Smartphone with the best camera, the Redmi Note 6 Pro now seems to continue the parody. The 12 MP and 5 MP dual camera at the back is retained, and the primary sensor now has 1.4-micron pixel size and dual-pixel autofocus. The secondary depth sensor helps the user with portraits and bokeh shots. The macro shots shot by the device are just beyond the brilliance. The low light photography does not lag back from impressing. Overall, we can say that Xiaomi Redmi Note 6 Pro is a perfect mid-range choice at a crazy low price in GearBest. The actual cost is $225.56 while you can get a deal from GearBest and grab it only at $189.99. To do that, you need to click the link given below and make the purchase where a promo coupon is already applied. The Redmi Note 6 Pro is a great all-round package and is definitely the best deal when the mid-range smartphones are considered. It offers the great value and reliable performance at the best deal of $189.99 making it an overall affordable, excellent and dependable smartphone in the mid-range smartphone. So, just get off the fence make the most of this deal at GearBest before it ends. Next articleMeizu resort to Indiegogo to fund its $1299 “holeless” smartphone!